Jennifer Grygiel is a social media professional who most recently served as social business and emerging media manager and assistant vice president at State Street Corporation in Boston. There, they developed a social listening and marketing data and analytics program and was the lead project manager for the Social Intranet Project, which received an IABC Gold Quill Merit Award. Grygiel’s social listening work has also been recognized and received a Gold Wommy for Social Media Monitoring Implementation from Womma (Word of Mouth Marketing Association). Over the course of their career they served as the executive director for public affairs and communications and chief of staff at the Committee on Capital Markets Regulation, a Cambridge, Massachusetts-based nonpartisan research organization dedicated to improving the regulation of financial markets. 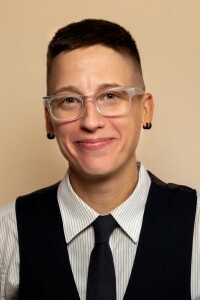 Grygiel has also worked at the Program on International Financial Systems at Harvard Law School and is the founder of No Gay Left Behind, which advocates for the development of virtual gay-straight alliances (VGSAs) via social media. They earned a bachelor’s in art and education from St. Lawrence University and completed the graduate program in management with a concentration in finance and control from Harvard Extension School. Grygiel took first place in the 2016 Best Practices in Ethics in an Emerging Media Environment teaching competition, sponsored by the Association for Education in Journalism and Mass Communication (AEJMC) Elected Committee on Teaching. Areas of interest include social media; emerging media; decentralized applications; community policing; financial technology (“Fintech”); LGBTQ youth advocacy; social justice and race, gender and society. For more information, please my about page. Stocks: given my area of expertise, and interest in participating in corporate governance via proxy voting, I have less than 150 shares in each of the following publicly listed companies: FB, GOOG, TWTR, BABA, LNKD, YY, and SNAP. I own nominal amounts of bitcoin and ether. Grygiel is a featured guest on CBS News. A full list of media commentary can be found here. Grygiel, a social media expert and assistant professor of communications at the Newhouse School, discusses Facebook’s content moderation problems in light of the Cleveland Facebook murder in this interview with MSNBC/Katy Tur on April 18, 2017. What’s on your mind, Facebook user? Facebook Chief Executive Mark Zuckerberg in a Facebook post on Saturday played down the impact of fake news, while also saying that his company is developing tools to curb it, including one that would allow users to flag news that they believe is fake. But Syracuse University communications professor Jennifer Grygiel, who studies social media, said relying on users is inadequate. Instead, she said Facebook should hire more workers to review widely shared articles and remove those that are false. In his Saturday post, Mr. Zuckerberg said Facebook is developing tools to curb fake news, including one that would allow users to flag news that they believe is fake. Syracuse University communications professor Jennifer Grygiel said relying on users is inadequate. She said Mr. Zuckerberg should hire more workers to review widely shared articles and remove those that are false. “When you get a lot of eyeballs on something, you get a lot of money. But there’s been no talk of what would be just and fair in the world, and would be good for us to do as people,” says Jennifer Grygiel, Assistant Professor of Communications at Syracuse University. In the tense aftermath of the election, Twitter may be even less effective at cracking down on abusive behavior anywhere on the political spectrum, said Syracuse University communications professor Jennifer Grygiel, who studies social media.